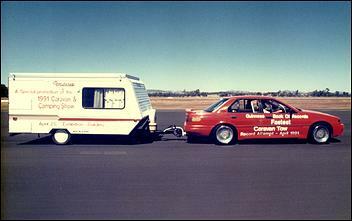 When I think of towing a caravan, I normally come up with images of retired couples touring around Australia at 20 kays below the legal speed limit. There's no doubt that towing a caravan at higher speeds is relatively dangerous and, when you think about it, the immense aerodynamic drag you're up against calls for a hell of a lot of power. AVO's Terry Wilson will give you the drum on that - he knows all too well how much power you need to pull a caravan at Mach 1. 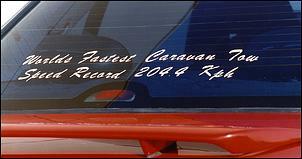 You see, back in 1991, his fairly innocent looking EA Ford Falcon was the machine that set the World Record for the Fastest Caravan Tow - how does 204.4 km/h grab you?! Terry never intended to tackle anything quite like this, but when the promo opportunity presented itself, it was too hard to resist. 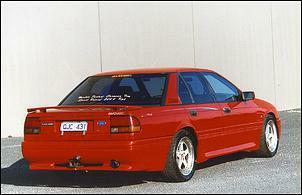 Terry had already bought this near-new 1990 Falcon S-Pack 5-speed from his previous boss and, back in those days, it was 'the thing' to have a go at turbocharging Ford's torquey 3.9-litre six. AVO used this vehicle for their R&D, and - after developing various stages of kits - there was nowhere left to go but insane. Extracting more and more power became a personal challenge. Moving up from a fairly mild set-up using stock pistons and 10-psi boost, Terry stripped the Blue Oval engine down and ordered in the goods that would enable it to stomach some more turbo pressure. Forty thou oversized forged pistons (giving a compression ratio of around 7.5:1) went in, as did shot-peened rods and heavy-duty bolts. The SOHC 2-valve-per-cylinder alloy head copped a port and polish and was reassembled with larger intake and exhaust valves, stiffer springs and a mild cam. Using the specially cast exhaust manifold designed for the more basic turbo kits, Terry stuck a dirty big turbo on the side of the alloy head - a custom T04S (with an internal wastegate). Having passed through the turbo, waste gasses were channelled down a 4-inch dump pipe and a mandrel 3-inch system with a single cat and dual mufflers. With the turbo compressor initially set to around 15 psi, a custom front-mount air-to-air intercooler smothered charge air temps. Terry says the core measures around 18 x 18 x 3 ?-inches in size, and there's a cut-out in the front bar to give it a flow of cooling air. Of course, back in the days, there weren't so many aftermarket programmable computers on the market. 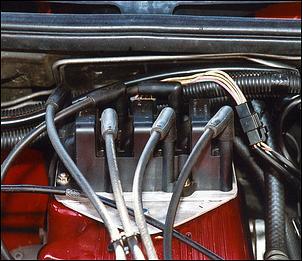 Accordingly, additional fuel made its way into the Ford's belly through a brace of six extra injectors controlled by a Micro-Fueller add-on computer. Ignition was standard. 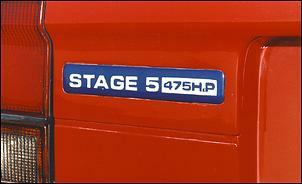 With a boosted 3.9-litre six, everybody was anticipating big torque - it's just a shame the stock 5-speed gearbox wasn't. Having blown it into many small pieces, Terry installed a SVO replacement 'box, together with a twin-plate clutch and a lightened flywheel. The rear-end is now a Ford 9-incher spinning a 2.9:1 ratio LSD centre. Apparently a 3.5:1 ratio was tried, but all this did was leave two black lines up the street whenever any amount of throttle was applied. With the driveline pretty much taken care of, the next area to be addressed was aerodynamics; of course, airflow can make or break any high-speed attempt. A quick fix was to seal up the majority of body margins with tape. Standard springs and shocks were a long way off being suitable for such a daring attempt, so Koni adjustable dampers replaced them along with King springs at each end. The suspension pick-up points were also relocated to alter squat characteristics and camber change angles. Swaybars - front and rear - are adjustable Whiteline. Come the day of the big tow (organised at a nearby airport), Terry had very wisely enlisted the services of a professional race driver. However, some familiarisation runs revealed that the caravan wasn't being pulled along as quickly as expected. 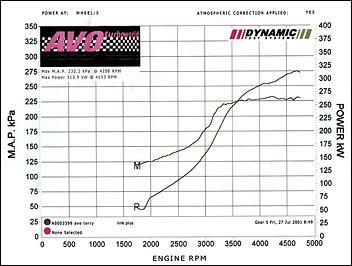 On 15 psi, the max speed was 186 km/h, on 18 psi it was 188, and - just when they were setting it to 27 psi - they figured they were s-o close to being un-wastegate'd, they might as well pull the line off the actuation canister. Yee-ha! The local constabulary radar-timed the 32 psi-boosted Falc dragging the medium-sized Roadstar caravan (complete with gas bottle and all) at an amazing 204.4 km/h. 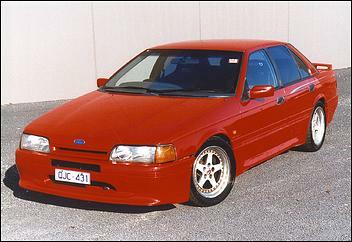 Not long after the celebrations and good-times had ended, that SVO 5-speed cried enough - so Terry got serious and adapted a VN Group A 6-speed into the trans tunnel. No more probs in that department any more. A fair while later, Terry also decided to ditch the 12-injector set-up to make way for a giant set of 100hp injectors controlled by a Link programmable computer. 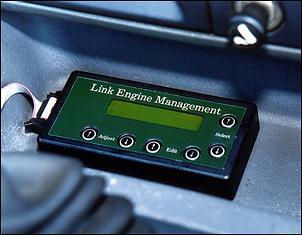 This module also controls an upgraded ignition system, comprising 3 double-ended coils out of a later model Falcon. 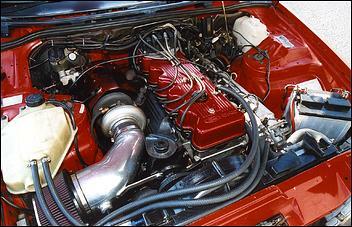 The intake was also heavily revised, with a 75mm throttle body mounted on a custom large plenum. A 48mm Garrett external wastegate also found a home alongside the same T04S turbocharger. Power? Try around 314kW at the wheels on 'only' 20psi! Still, Terry comments that the big stroke engine doesn't like to rev. It reaches full boost by about 2800 rpm, but it just doesn't want to rev past 4800 - no matter what you do. And the adventurous life of the Falcon wasn't yet over! After generating a fair bit of publicity, one of AVO's customers in Japan read about the feat and simply had to have the car. Folllowing a financial exchange, Big Red was being shipped to Japan - ready to mix it up on the streets with the local Skyline GT-R boys. 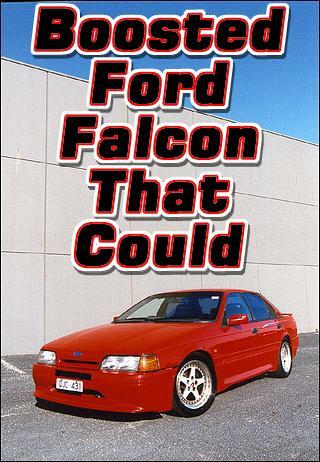 Once back under the roof of AVO's workshop, Terry soon observed why the Falcon wouldn't run - 3 rods had been chucked outa bed! Due to time limitations, a set of replacement rods and pistons were whacked in to get it going again - some mega-strong rods will go in some time soon. Pouring over his long-lost friend, Terry was amazed how absolutely nothing had been touched on it. Even the full Recaro interior, the 17-inch alloys and the custom body kit (made by a previous AVO employee) remained in service. 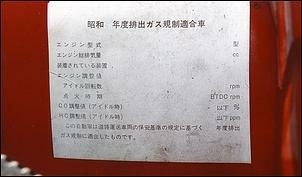 Perhaps the only additions were the Japanese-spec number plate mounting at the rear and the Japanese compliance plate. After he gets around to slipping the big rods go in, Terry says he isn't quite sure what he'll do with the beast. He might throw it into some dyno days - but we can't help wondering if he'll take up the tow challenge again. You see, somebody's recently pipped the Falcon's record by just a couple of kilometres an hour - using a full-house Dodge Viper if you don't mind!